Pharmaceutical Name: Radix Angelicae pubescentis. Common Name: Pubescent angelica root. Part Used & Method for Pharmaceutical Preparations: The roots are dug in spring or autumn and then baked and cut into slices after the fibrous parts have been removed. Properties & Taste: pungent, bitter and warm. Meridians: Liver, kidney and urinary bladder. Functions: 1. To expel wind and dampness; 2. To stop pain; 3. To release the exterior and disperse cold. 1. Wind-cold type of exterior syndrome. 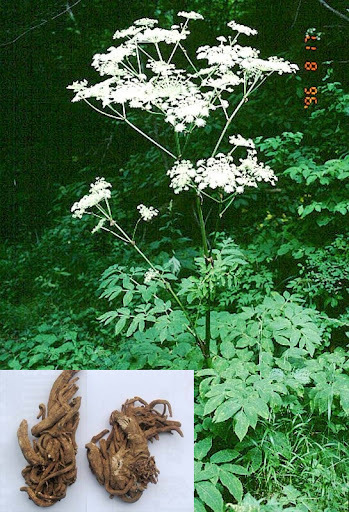 Pubescent angelica root (Duhuo) is used with Notopterygium root (Qianghuo) in the formula Qianghuo Shengshi Tang. 2. Wind-damp obstruction syndrome (rheumatic pain). Pubescent angelica root (Duhuo) is used with Large-leaf gentian root (Qinjiao), Ledebouriella root (Fangfeng) and Mulberry mistletoe (Sangjisheng) in the formula Duhuo Jisheng Tang. Cautions & Contraindications: This herb is contraindicated in cases with syndromes of deficient yin or blood with heat and pain.